Another year is upon us. A time to reflect on successes from last year and begin plans for the new year. When it comes to your trade show participation, what will you do differently? What will you repeat? What will you tweak? As you begin plans for 2014, take a moment to review the return on investment from last year’s trade show attendance. All of the exhibit websites are predicting a rise in attendance as well as an even better quality attendee; the decision makers are looking to spend some money in 2014. What worked and what didn’t at each of the shows we participated in? Which show provided the most leads? How qualified were the leads? Which show generated the most in booth interest? Which new shows should we add to the mix? Did the sales team request additional resources? What were they? How possible will it be to deliver for 2014? Should we add WiFi connection to enhance our presentations? Who was the most productive on the team? What did attendees ask for that we missed? What graphics can be updated? How can we differentiate our booth from others? What should we do differently next year? The definition of insanity is “doing the same thing and expecting different results,” however, another definition might be doing the same thing and hoping it will be enough to produce the same results. With the massive technology changes and the total consumption of social media, how will you keep up with the need for speed this year? Social media is the watch word for the New Year in every aspect of connecting with prospects and existing clients and your trade show exhibits will benefit from the ability to include touch screen technology and real time interaction. Twitter, YouTube, Instagram and Facebook are how consumers gather and share information. Make sure that you include technology as part of your trade show activities this year. You may want to look into the Mobile iPad Trade Show Application for your handheld devices. Hourly special offers bring attendees back to your trade show displays multiple times throughout the weekend. Twitter is a great resource to connect real time with attendees. Online product catalogs and video demonstrations of your product help prospects envision how your products help their business. Check out the touch screen, interactive table technology monitors; the investment pays for itself with the opportunity to stand out from the competition, demonstrate products and connect with prospects. Articles at TSNN, CEIR and Exhibit Surveys all predict a continued rise in attendance, an increase in the decision makers who will be attending and a longer amount of time people plan to spend in each trade show exhibit. Just being there won’t be enough this year. So what will you do differently this year? Not sure? Give us a call. We can help. Why should I attend a trade show or convention? 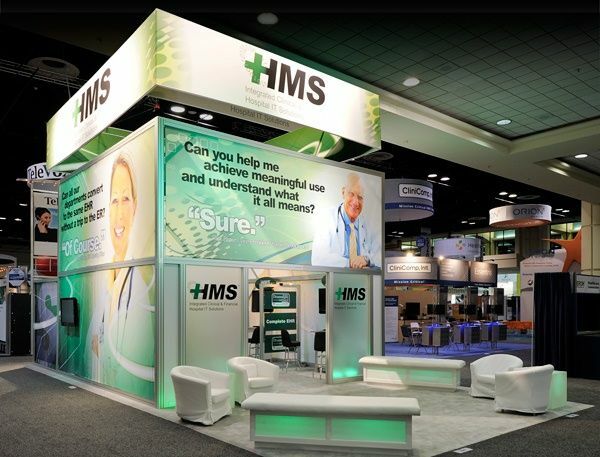 What are the objectives served by attending one, or exhibiting with trade show booths and displays? According to the Center for Exhibition Industry Research, there were over 14,000 trade shows and conferences in the U.S. in 2005. Whatever industry you may specialize in, there’s a trade show, conference or expo just for you. TSNN offers a listing of the fastest growing trade shows for 2013 both in square footage as well as attendee numbers. Exhibiting with trade show booths puts you face-to-face with hundreds and sometimes thousands of qualified attendees. Many of those attendees use their industries’ big trade shows to research products and services before a purchase. An industry study found 83% of attendees have some type of buying power. For an exhibitor, these attendees are a good source of new leads and even show floor sales. Twenty-two percent of sales and marketing executives say trade shows are the top-producer of leads among all their marketing programs. In addition, the costs of generating and closing a qualified lead via exhibiting with trade show booths is less than that of generating and closing a field lead, according to the CEIR Study on Economics of Exhibiting.